Since the navy filed a lawsuit on the rights to indemnity against 116 anti-base individuals and 5 groups including Gangjeong Village Association, some internationals were willing to send protest letters to the South Korean government. 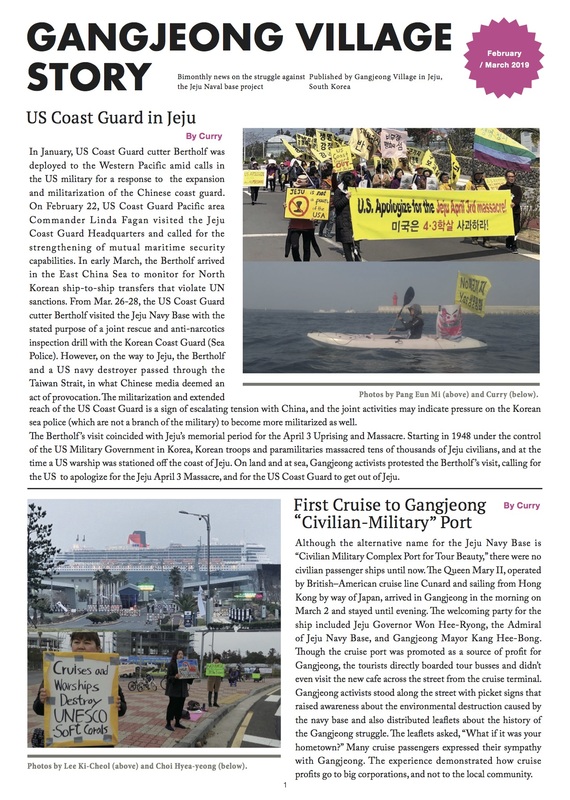 Following an April 24 appeal for protest to the South Korean navy lawsuit (See here), many more peace activists in the world have joined them. They thoughtfully sent us their solidarity messages to Gangjeong and/or forwarded us their protest letters to the South Korean government/ embassies. We are updating this site, as well as sharing the original and translated messages with Koreans. Thanks so much to the friends who took their precious time for Gangjeong. We appeal other friends in the world again to please help us by paying attention to the appeal for protest in the site. The name of senders are listed here by alphabet order of family name. We send our greetings, respect and gratitude for the superhuman courage, peacefulness and tenacity you have shown in opposing the construction of a naval base on your home of Jeju Island. Like millions of people around the world who fight against ecological damage and global warming, we support you who are on the frontline of resistance on behalf of us in every country who value the unique natural and cultural heritage of Jeju Island. Peace movements around the world join in thanking you for resisting a U.S. and South Korean naval installation that would militarize and endanger the safety and peacefulness of the people JeJu Island and our world. We write now because we are shocked to learn that, not only have you been forced to endure violence and imprisonment for your actions in the service of peace and environmental justice, but the South Korean Navy is now demanding $2.9 million in damages from 117 Jeju island residents, activists and local citizens for exercising a human right to nonviolent protest and free speech. This is in direct contradiction to Article 19 of the International Covenant on Civil and Political Rights, which guarantees freedom of expression. We urge the South Korean Navy and government to immediately drop demands for this unlawful penalty that would negate an inalienable right to free speech and assembly, and send the anti-democratic message that all who oppose state actions are subject to ruinous fines. Your actions have inspired all who value democracy, peace, and the environment. Your courage is contagious. We thank you, and we stand with you. “We stand wholeheartedly with the residents of Gangjeong Village. Since 2007, the people of Gangjeong have used every democratic measure and every non-violent means of protest in order to oppose the construction of the new naval base there and to challenge the re-militarization of Jeju Island. Gangjeong residents and peace advocates have a right to freedom of expression‎ by protesting the base, which jeopardizes peace in the wider region by rendering Northeast Asia far more vulnerable to the risk of future military conflict. YOUR FIGHT IS OUR FIGHT!!! 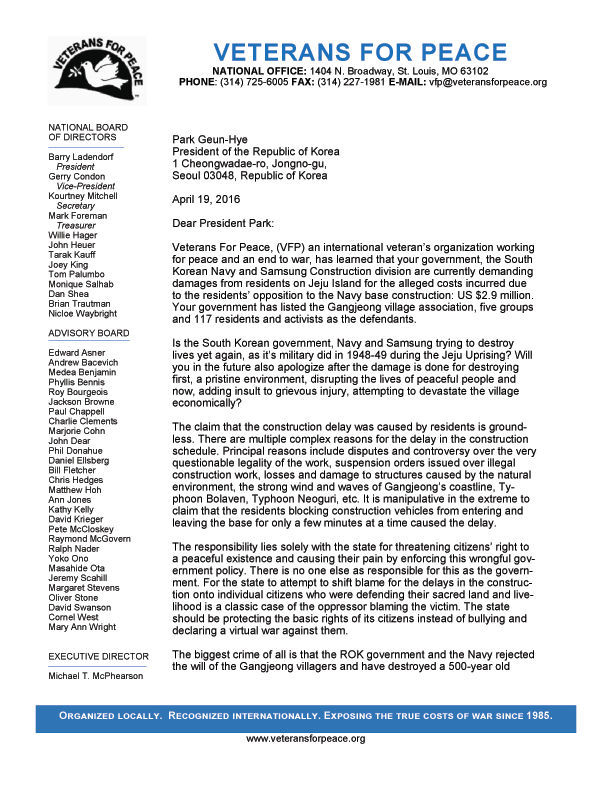 This letter is written to vehemently call for the dropping of the Republic of Korea Navy’s action against the Village of Gangjeong, Jeju Island, in its filing of a lawsuit seeking indemnity rights, or compensation for losses incurred during the construction of the Jeju Naval Base, officially opened in Gangjeong Village on Feb. 26, 2016. The Naval lawsuit demands 3 Million USD in its suit – a suit which will mean the destruction of this village, as it will have to liquidate all municipal assets to cover this, as well as the many citizens who will lose their property. This is an incredibly unjust and arrogant legal action. I humbly point out that there were a number time when concerns were raised about this particular construction, not just from the Gangjeong villagers and other related groups. A number of times the Governor of Jeju of the time, Hon. Woo Keum-Min, issued suspension orders stopping construction for hearings on issues like environmental assessment and because the company had neglected to install, or had installed, faulty silt protectors that failed to protect the marine environment. And then there was Dec. 30, 2011, when the National Assembly, in its end of the year deliberations, cut 96% of the 2012 budget for the Naval Base construction. That was amazing, and many people thought the plans would be significantly changed at the time, one editorial suggesting perhaps the construction area would become a coast guard facility. As well a typhoon that struck the area early in the construction period which caused damage to the caissons being installed, necessitating that the job be done again. I write on behalf of the International Rural Church Association which is concerned about this rural farming-fishing community in Korea that is struggling to survive in the face of great changes. Often rural communities bear the brunt of development of industrial-military or resource extraction facilities. 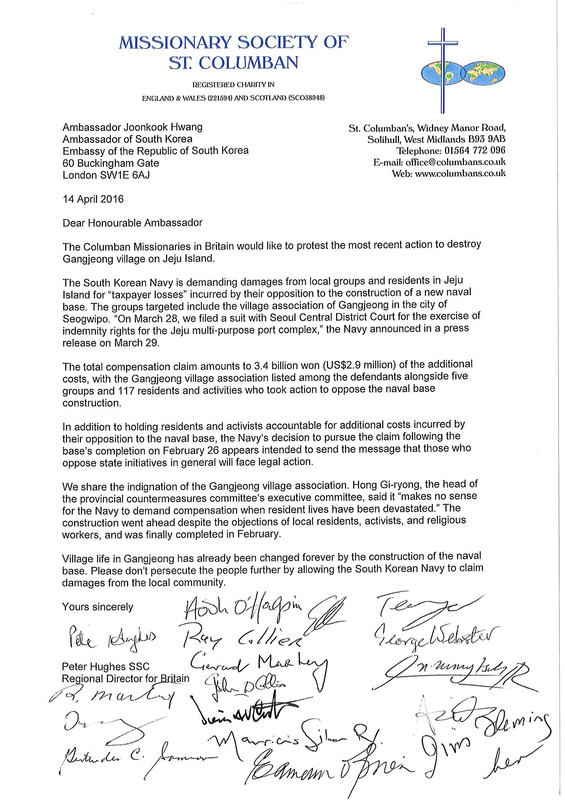 IRCA stands on behalf of sustainable rural communities throughout the world, and in this regard, we strongly urge the government of Korea to reject this action of the Navy and its lawsuit against Gangjeong village. I sent the message below to the Korean Embassy in Canberra, Australia. Unjust measures have been taken against those who are peacefully protesting the construction of naval facilities on Jeju Island. The lawsuits taken out against local residents are wrong and should be dropped. We neither want nor need more war-waging facilities, on Jeju or anywhere else! thank you for your amazing persistance in the struggle. As I am travelling in Brasil and not at home in Germany I can only send a very short message of solidarity to you. In October/November 2013 I took part in a solidarity mission of “Peace for Life” in resistance against the military base on Jeju Island. So I know the brutal oppression of the people in Gangjeong. 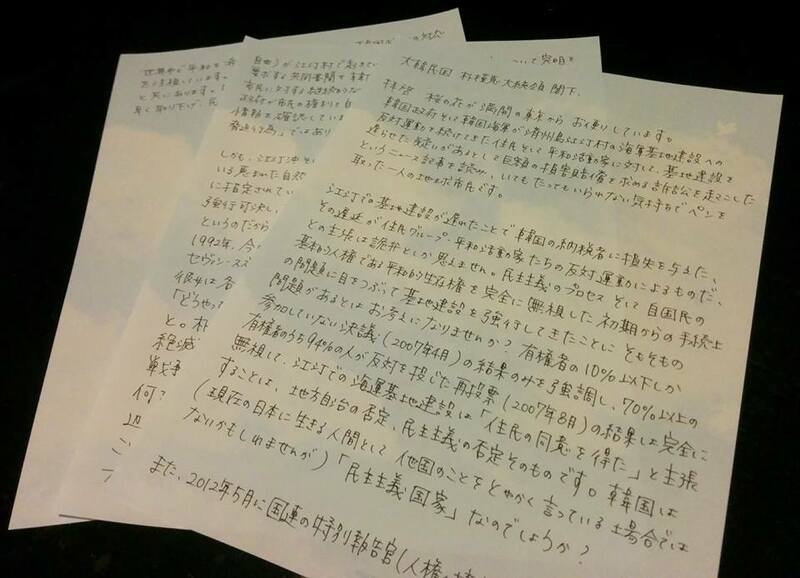 I wish you full success in your struggle against the lawsuit . Keep up the work, your non violent protest is very important and I will be writing to President Obama about your situation. We have learned that your government, the South Korean Navy and Samsung Construction division are currently demanding damages from local groups and residents on Jeju Island for the alleged costs incurred due to the residents’ opposition to the Navy base construction: US $2.9 million. Your government has listed the Gangjeong village association, five groups and 117 residents and activists as the defendants. Thanks for the updates. Philippines will surely respond to this. We will also circulate your appeal to our global network. In solidarity and more power! Please drop the charges against the villagers of Gangjeong, Jeju Island, Korea. The South Korean government, Navy and Samsung are demanding damages from these villagers for the alleged costs incurred due to their opposition to the Navy base construction. The Gangjeong village association, five groups and  residents and activists have been charged with paying $2.9 million (US dollars). The world has witnessed the brave non-violent resistance of the villagers to the destruction of their community and to the environmental ‘special preservation area’. The State (and typhoons) bear the responsibility for construction delays for rejecting the will of the Gangjeong villagers. I’ve just emailed the letter to President Park via the US and UK embassies and posted via Facebook links to your recent post. I wanted to send along an image of a painting that I created in 2009 (part of a solo show I had at the Jeju Hallasumokwan). I believe this image has been used previously in your campaign as I sent it in previously (although years ago). It is based on a photograph I took at Gangeong Villiage in 2009. 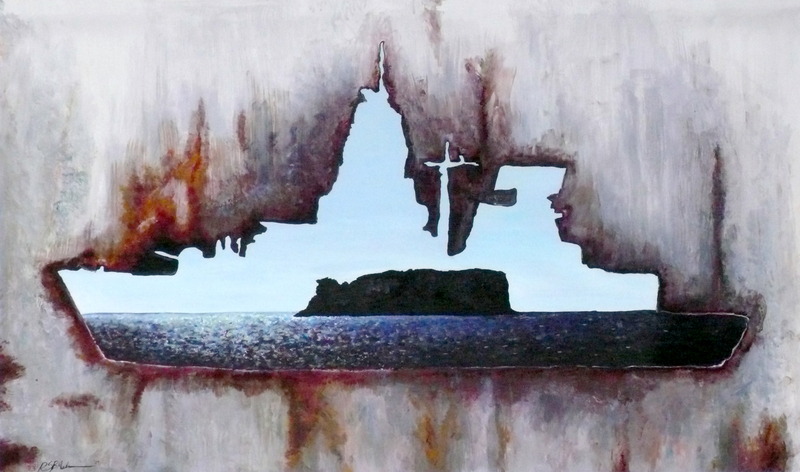 I took the shot through the foreground of an artpiece that was installed on the coast. A beautiful metal piece. I hope it is still there? Do you know it? I wonder if you know the name of the artist who created this piece. I would love to credit them if I use the image in the future. I lived on Jeju for a year in 2009 and felt deeply the concerns the residents of Gangeong and Jeju regarding the Naval Base construction. I have stayed connected through your newsletter and facebook posts. I always feel I wish I could be in Jeju now to help support this cause. I hope the small actions I have taken and hope to continue taking in the future will help Jeju reclaim it’s waters, it’s Gangeong Village, and it’s reputation of Peace Island. There is so much injustice in this world, so much war, destruction, and power struggle. Jeju is an amazing, inspiring place – they are proud of being ‘Peace Island’ and want to keep it that way. So do I! Thank you for keeping those who can’t be present in Jeju up to date with what is happening and continuing to spread the word and get the international community behind the cause. Migrante International, a global alliance of Filipino overseas organization, salutes the people of your village for its courage and staunch defense of your village and your rights. We stand with you in solidarity against the militaristic machinations of the US government. Military interests in using Jeju as a base is another expression of violence which should be opposed by every non-violent means. The world needs to dismantle military vases not build more. Congratulations on your brave stand. It is a travesty for any country based on the principles of democracy to sue citizens for engaging in their right to peaceful protest. This lawsuit lacks courage and wisdom. Demanding damages from the people of Gangjeong Village reveals the pettiness of a supposed “advanced economy.” The fact that Samsung—the sixth largest corporation in the world whose revenue was (US) $305 billion in 2014—would seek damages from groups that only sought to protect their community; and that as President you would undermine the will of this community, only shows the world that your vision of Korea cares more about global corporate governance than people. I love Korea and am honored to have stood beside Gangjeong Village protesters when I visited Jeju. As much as I lament the loss of Gureombi Rock and the destruction and insecurity that you have brought to the community, I equally object to your anti-democratic values. Like so many others, I am appalled by the news of the lawsuit that you are all facing now. I am appalled, but not surprised, because the ROK government and Navy, and the Samsung Corporation have already made it very, very clear how little they care for democracy, human rights, and the right of humans and non-humans to a healthy, living environment. Still, this latest assault upon you good people leaves me feeling very sad, …and angry! 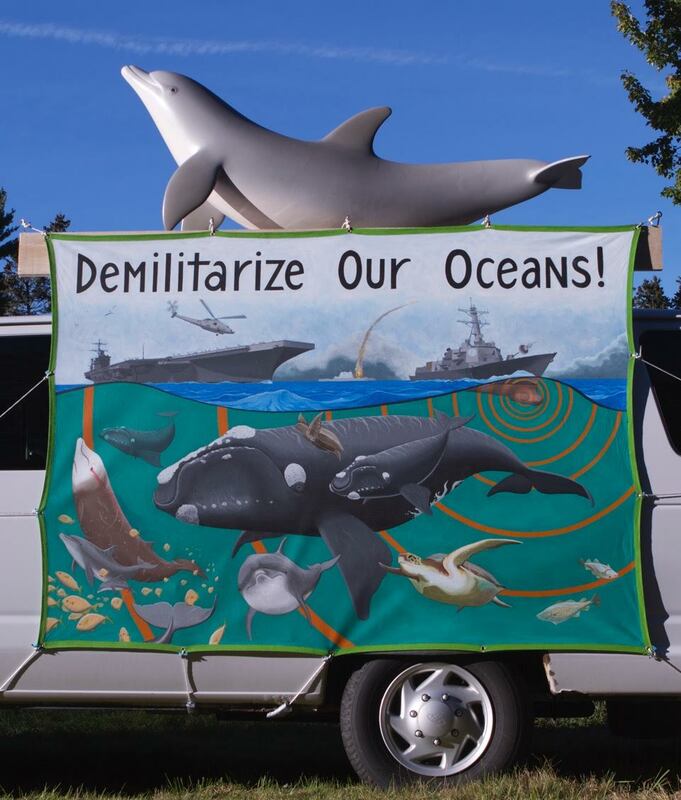 I am writing to you today on behalf of Citizens Opposing Active Sonar Threats (COAST) regarding the US $2.9 million fine being leveled at Gangjeong Village residents, activists, and organizations by the government of the Republic of Korea, its Navy, and Samsung. 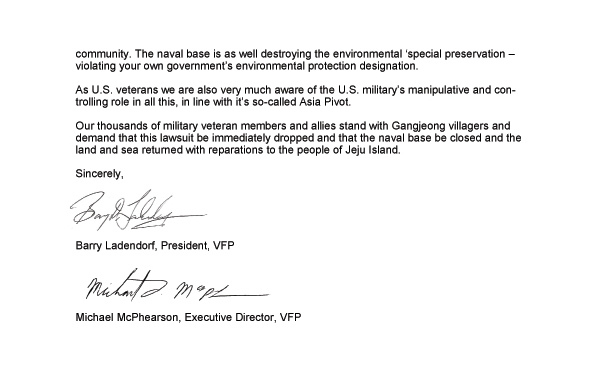 We believe this fine to be a gross injustice; one which is being directed at people who have already had to face the great injustice of having the Navy base in Gangjeong Village forced upon them against their will, resulting in the destruction of their village, their way of life, and their once-beautiful environment. The people who opposed the construction of this base had, and continue to have, every right to do so, given the very plain fact that the South Korean Navy used deception and bribery in an attempt to make it appear as if the village supported the base construction. But we know that this “village approval”, with only 87 of Gangjeong’s 2,000 villagers present, was a total sham, with most of the villagers not even having heard of this meeting until after it took place. Following that, the village held a referendum on the matter, with 94% of the eligible voters voting against the base. Clearly, the people of Gangjeong did not want or approve of the base! Their opposition to the base was, and still is, entirely justified. Furthermore, it is clear that their were numerous factors involved in construction delays other than protests. These other factors account for a far greater portion of the delays than do the protests. Some of these other factors include the Navy’s very bad decision to cite the base at Gangjeong, given its susceptibility to extreme wind and waves.There were the typhoons Bolaven and Neoguri, and their resulting damage to the construction, as well as suspension orders that were made due to the illegality of the construction. To place the blame for construction delays solely on the people and organizations opposing the base is beyond unreasonable. Regarding the base at Gangjeong Village, the government of the Republic of Korea and its Navy have trashed the democratic process and inflicted great injustice, pain, and destruction upon its own people and environment. When the people of the world hear the real story of this, they will know that the notion that South Korea is a democracy that is committed to human and environmental rights is simply false on each count. COAST strongly urges the South Korean government to drop the charges and fines against these people and organizations immediately, and to begin the conversion of the base from militaristic to peaceful, life-promoting purposes. Thank you for your consideration. We look forward to your response. And a same email to the South Korean Consulate in Boston , with Bruce K. Gagnon’s April 9 letter being forwarded , too. I am very distressed to hear that you are being targetted by the Government, Military and Corporations, for your lawful, peaceful, humanitarian resistance to war and destruction. Your protests are part of a world-wide movement for peace, real security and global citizenship. The navy’s lawsuit that so wrongfully tries to stop your resistance shows just how successful you have been and is part of their long history of denying civil rights and trying to destroy your struggle and resistance. Please know that you have friends all over the world that stand with you and care about you. I do hope that you can keep up the strength to go on resisting. We are in a time of global stress when the forces of peace and justice are facing the forces of militarisation and corporate greed. It is a time of deep conflict and change and we all need to keep strong and hopeful and not lose heart. I love and respect all your hard work for peace and think of you as colleagues and friends connected together in our joint struggles for a better world. As we, here in the UK, continue our struggle to resist the replacement of the UK’s nuclear weapons with our own civil resistance, we will remember and honour your struggle and do what we can to let people know about the outrageous US$2.9 million lawsuit currently threatening the village. Love, peace and strength, Angie Zelter. Angie Zelter, is the founder of Trident Ploughshares (Right Livelihood Award Laureate), Faslane 365, International Women’s Peace Service-Palestine and various other organisations. She is author of ‘Trident on Trial – the case for peoples’ disarmament’, ‘Faslane 365 – a year of anti-nuclear blockades’, ‘World in Chains’. She is active in organising civil resistance against nuclear weapons and the arms trade to uphold international law.